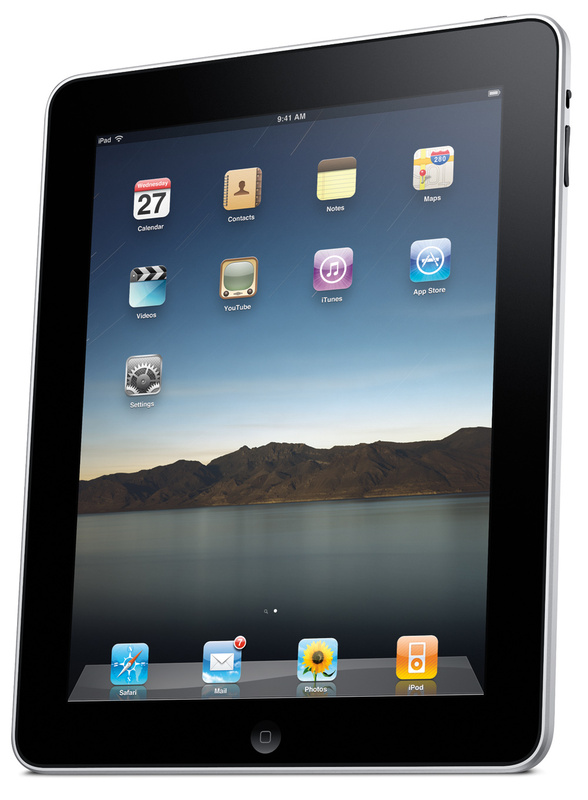 The Apple iPad is about a half-inch thick, 9.56 inches tall, and 7.47 inches wide. The WiFi-only model weighs just 1.5 pounds. It sports a 9.7-inch capacitive touch screen IPS display with a 1024 x 768 pixel resolution. There’s plenty of connectivity as well, with support for WiFi a/b/g/n and Bluetooth 2.1. It is also offered in a 3G flavor for AT&T’s network. It works well with mapping software since it has an assisted GPS module and can also use cellular towers for better accuracy. The unit comes in four storage capacities: 16GB, 32GB, or 64GB flash storage. It runs at 1 GHz on Apple’s own A4 custom-designed processor. Like the iPhone, it of course features an Accelerometer to detect when rotated and an Ambient light sensor to automatically control display brightness. For video formats, it should be able to play just about all the formats that the iPhone and iPod Touch support, but in HD quality. Just like the iPhone OS, it supports display all the office file formats that the email client currently supports. (e.g. jpg, pdf, doc, xls, ppt) There’s no physical keyboard, but rather an on-keyboard that’s apparently large enough to type on with two hands. 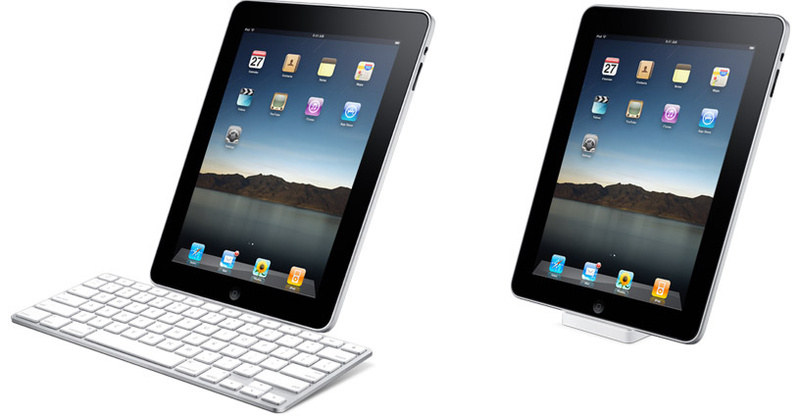 Apple did demonstrate a special keyboard dock accessory. There’s a built-in non-replaceable battery that Apple claims will offer 10 hours of productivity on a full charge. A regular Apple USB cable charges the device with an AC adapter or with a computer. Other than that, it has a regular 3.5mm headphone jack, speakers, a microphone, but no webcam. 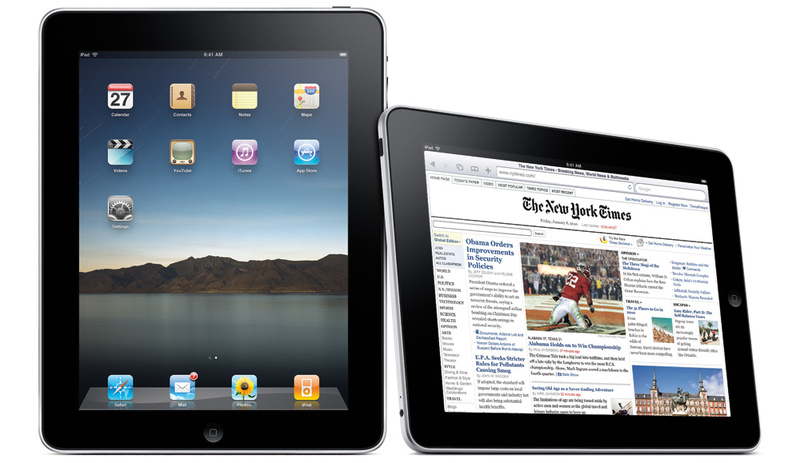 The iPad’s OS isn’t the same as the iPhone OS or even Mac OS X. It’s a special version that stands between the two. If anything, it’s more like the iPhone OS. That’s because it can run just about any App that’s currently available for the iPod Touch or iPhone. If you didn’t notice the screen’s quite larger. That means that an iPhone-optimized App won’t fit properly. Apple lets you run the App surrounded by unusually large black border in the center of the screen. If you prefer, there’s a magnify button that doubles the size of the App, however leaving you with a low-resolution program. It doesn’t seem to support multi-tasking or running multiple programs simultaneously. While that might take previous iPhone and iPod Touch owners some getting used to, the built-in programs are fortunately redesigned and well polished. Everything from the Safari web browser to mail client, photo viewer, maps, notes, calendar, contacts, and more have all be optimized for a 9.7-inch display with plenty of new features. Even multimedia support has improved with an improved iTunes browser interface for browsing and purchasing content on the go. The iPod app now has an interface that looks somewhat of a mix between the desktop version of iTunes and the iPhone player. It all seems a bit risky of a play on Apple’s part, however we’ll see how it holds up and if it plays well with customers in sometime. Yes that’s right, Apple did just take a stab at the Amazon Kindle and Barnes & Noble Nook. The iPad makes for a better device than the iPhone for reading books since it has a larger display. As expected, all books will be available for purchase through a new section in the iTunes Store. Books from both independent and major publishers will be available. 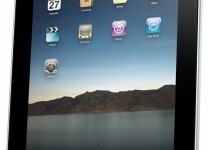 Apple demonstrated a “Bookshelf-like” interface for browsing through a collection of downloaded titles. Notice: Sorry for the delay, we were having some server issues, we’ve updated the content below. Apple also ported the famous productivity suite, iWork, over to the iPad’s keyboard-lacking touch-screen interface. Pages, Keynote, and Numbers won’t just be document viewers, but rather will allow creating and modifying documents. 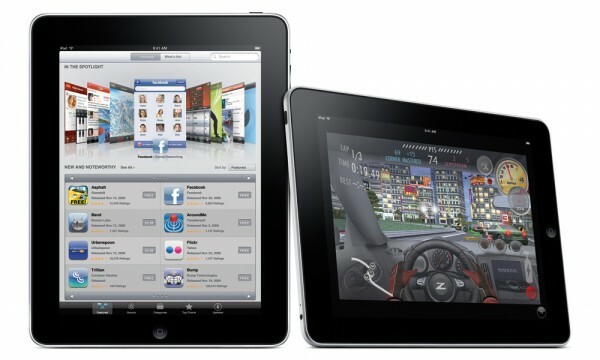 And of course, the entire package works seamlessly in a multi-touch environment. It supposedly supports handling Microsoft Office documents as well. Each of the iWork Apps will run you $9.99. It’s hard to tell whether being truly productive and working at a fast pace with solely an on-screen keyboard will be possible. As mentioned previously, the iPad will be available in two versions. The WiFi-only model will be available worldwide in late March at retail price of $499 for the 16GB model, $599 for the 32GB model, and $699 for the 64GB model. The WiFi + 3G model will become available in April at a slightly higher cost: $629 for the 16GB model, $729 for the 32GB model, and $829 for the 64GB model. The 3G version will surprisingly sell without a AT&T contract with two data plans offered. A $15/month plan has a 250MB data transfer cap while $30/month plan offers unlimited data. As a bonus, iPad users will have free access to AT&T’s WiFi hotspots as well if subscribed to a plan. Will one be able to use the kindle iphone reader on this machine? That would mean you would have the ability to read kindle generated books (some at lower prices) and read books one has already purchased on amazon.com or will apple somehow block the use of this software. I still cannot believe that this hot new chip cannot run multiple programs at the same time. The original Macintosh could do this! And where is the camera? The iPad did not live up to its expectations at all, if you ask me. I think the Lenovo IdeaPad U1 Hybrid blows this one out of the water. We did an article on the U1 before the debut of the iPad, and I still hold true to my beliefs. Apple could have done more, but in their absence, Lenovo delivered. Couldn’t agree more. We will be getting the U1 IdeaPad in June. Stay tuned for our review! hej jag vill ha en ipad stor och den ska vara fin?…!!! !